Amazon.com description: Product Description: Widely used in introductory literature courses, this book provides valuable guidelines for interpreting literature and writing essays. It includes a thorough discussion of the 3 main literary genres--fiction, drama, and poetry, an overview of literary theory, guidelines for writing essays, procedures for writing and documenting research essays, a selection of full-length works that illustrate key points, and student essays. This text provides valuable guidelines for interpreting literature and writing essays about literature. About: Widely used in introductory literature courses, this book provides valuable guidelines for interpreting literature and writing essays. 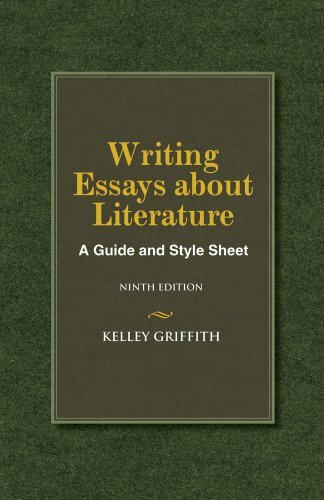 About: Widely used in introductory literature courses as a style guide or as a supplement to anthologies, this text provides students with valuable guidelines for interpreting literature and writing essays. About: Widely used for introudcory literature courses or as a supplement to anthologies of literature, this text provides valuable guidelines for reading literature creatively.